The AN-Mini is designed for presentations with support for wired and wireless microphones and line inputs for projectors and computers. Great for Anyone Needing Amplification! 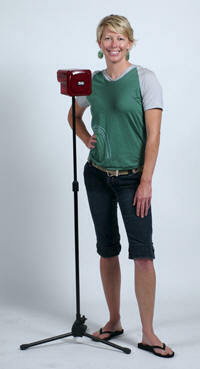 The AN-Mini is great for teachers, trade show booths or any person needing voice amplification. 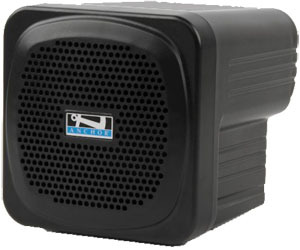 The AN-Mini has a flat bottom an sits easily on a table or order the optional speaker stand. The Anchor AN-Mini can also be ordered with a wireless UHF mic and built in receiver. The AN-MiniU1 offers 16 user-selectable channels for great wireless reception indoors or out. To save money purchase the Anchor AN-MiniDP Deluxe Package which includes the AN-MiniU1 with built-in wireless receiver and your choice of wireless mic: Handheld, lapel, Headband, UltraLite Over the Ear mic. View our Wireless Mic Demonstration and we'll try on all the mic and show you how they operate. The Anchor AN-Mini has the inputs you need for today's equipment. A 3.5mm line Input allows you to plug-in an iPod, MP3, and CD Player. A powered mic can be plugged into the 3.5mm Lo-Z phantom power jack and a1/4" mic jack is also available for the supplied mic. Playing music through the MiniVox Lite is as easy as connecting your iPod, MP3 or CD Player to the Line In plug. You can also talk over the music when using the supplied wired mic or the optional wireless mic. The MiniVox Lite volume knob controls the audio source and microphone levels simultaneously. Set the volume level then use the volume control of your music player to set the volume of the music. If using the model with the wireless mic there is also a wireless volume control that allow you to set the volume of the wireless mic separately. The MiniVox Lite volume knob will still control all the inputs of the MiniVox Lite including the wireless mic. With the optional 6000-18P you can control the music in your iPod or music player wirelessly! The 6000-18P cable has an 3.5 mm plug on one end that connects to your iPod or music player. The other end connects to the WB-6000 Body Pack Transmitter and allows you to transmit your music wirelessly to the MiniVox Lite. The music can be controlled by anyone who is within 200 feet of the MiniVox. Even sitting in the stands! You will loose the ability to use a wireless mic while using the transmitter with the iPod. Simply order any of the mics except the Handheld mic and check the 6000-18P option when ordering the Deluxe Package and you will have everything you will need. Science teacher and Cheer Coach, Brandi Turnbow, at New West School in Los Angeles, California got an AN-Mini for her classroom and outdoor science camp locations. She knew she needed to speak loudly and clearly to make sure every student could hear her above ambient noise in her classroom. The "hum" of the air conditioner and the "buzz" of background noise is a challenge for every instructor. Ms. Turnbow was also concerned with the strain on her voice as the day progressed. The Next Generation AN-Mini is Here! Mesh pouch on side of soft case it hold iPod or MP3 Player even when plugged in! AA batteries make the MiniVox Lite easy to carry! For applications where the AN-Mini PA system is used frequently, the RC-30 rechargeable battery kit is available. This kit includes 10 rechargeable NiMH batteries and an AC charging adapter. When fully charged the batteries provide approximately 12 hours of operation. The RC-30 is included when you purchase the Basic or Deluxe package.